Sunday, October 4, 1908 --Maurice Sayers and Johnny Murphy are set to duke it out at Jeffries Arena on the 6th. Both were rather lackluster lightweights; Murphy died of TB three years after this bout. Also another cartoon about Bill Desmond's 'trip around the world'. Nice call on that "automatic telephone"! Edwina Dumm made her lasting mark on the world of newspaper strips with Cap Stubbs and Tippie, a feature that ran for an incredible forty-nine years (or fifty or even sixty years according to some accounts, but I can't find it running any longer than 1918-66). Before her big break on the national scene she worked for the Columbus Monitor, a weekly newspaper that debuted in 1915, with Dumm lending a dose of graphic excitement right from the start on August 28 of that year. She began by producing a full page for each weekly issue, titled Spot-Light Sketches. 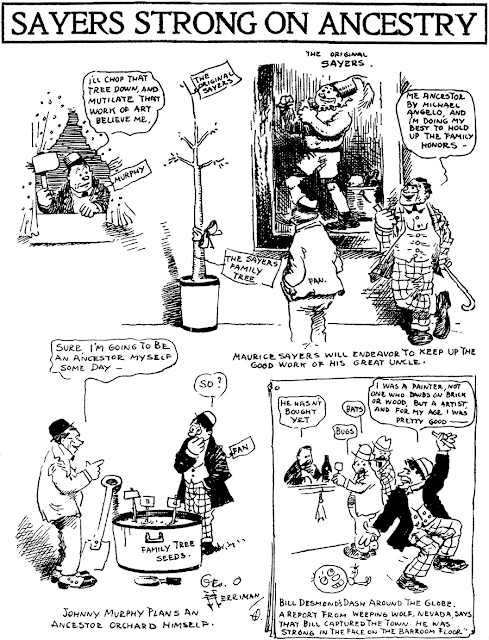 Since Dumm was the only cartoonist in the paper at the time, she decided to fill every possible role; the page included editorial cartoons, social cartoons, single-panel gag cartoons, and comic strips. As a sad commentary on the times, Dumm originally didn't take credit for the impressive page, signing it "By Monitor", accompanied by a 'self-portrait' sketch of a male cartoonist! I guess this was not the era in which a woman cartoonist felt completely comfortable taking credit for her work, unless it involved romance, cute kids and/or cherubs. What would eventually become the comic strip Meanderings of Minnie began as a panel cartoon of that title the first two weeks. It was then renamed What Bothers Minnie for five weeks. 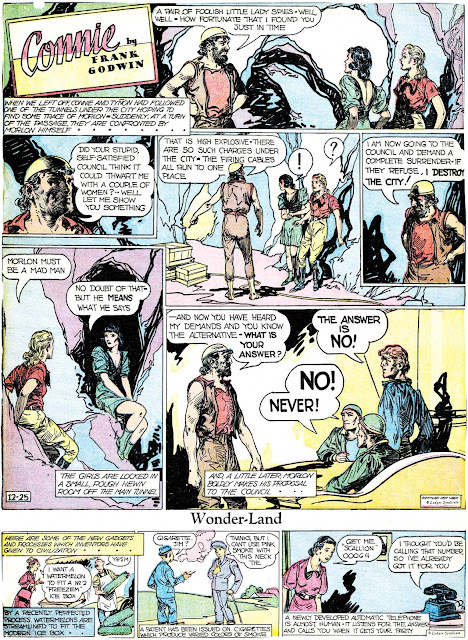 On October 16 the title reverted to Meanderings of Minnie and the panel cartoon morphed into a full-fledged comic strip. On December 4, having produced the page for over three months, evidently Dumm felt she had proven herself as a competent cartoonist, wrong gender or not, and "By Monitor" was dropped in favor of her name. On February 19 1916 the newspaper did a revamp, and the various cartoons of Spot-Light Sketches were now distributed throughout the weekly issues, putting an effective end to the feature. Meanderings of Minnie continued as a standalone. Then in July, the Monitor decided to go to a daily schedule, and Spot-Light Sketches was resurrected for their new Sunday edition. However, the Sunday edition only lasted a mere two weeks before it was deemed a sales failure, and the Monitor contented itself with a 6-days per week schedule from then on.For some reason, Dumm consigned not only Spot-Light Sketches to file 13, but also Meanderings of Minnie, ending both features with the issue of July 23. One could easily make the assumption that Dumm didn't feel up to a daily schedule, but this was certainly not true, as she was reportedly a remarkably fast artist. Dumm left the paper at this point, but returned for a short stint in 1917 right before the Monitor went belly-up. Thanks to the late Cole Johnson for the sample. When the editor of "Cartoons" asked me for an account of myself since I started in the cartoon game, you can bet I had to stop and think before grabbing a pencil. Getting down to brass thumb tacks, Indiana is the state of my birth and where I spent my boyhood days -- which I can truly say were real ones. Somewhere around my fourteenth birthday the folks decided for no reason at all that Chicago was the place for us to live, so then we moved -- and at that time the cartoon bug hit me. I'll probably never recover. 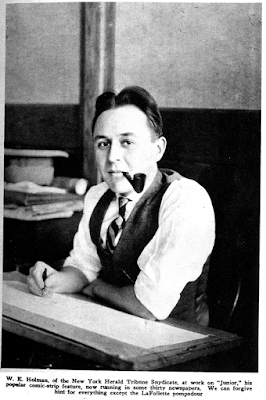 Advancing to my third year in high school and, at the same time attending the academy of fine arts I broke into the art department of the Chicago Tribune in the capacity of office boy -- which looked like a much bigger job to me than that of managing editor. This opportunity came through a tip from Quin Hall, my teacher at the academy, who was then sports cartoonist at the Chicago Daily News, and who has recently joined the King Feature Syndicate in New York City. My job as office boy was a short one for I took advantage of every opportunity and less than a year later really surprised myself when I sold my first full page idea to a nationally-known magazine, then published in Chicago. I lost no time in parading this before Bill Wisner, my boss, and art manager, -- and was again surprised when I was called on the green carpet and not fired but given a job on the art staff, where I remained for the next two years illustrating comic stories, assisting Frank King on Gasoline Alley, and everything else pertaining to the work in an art department. Unable to land a feature on that paper at that time, I continued to mail my drawings to various other syndicates and newspapers with the result that I connected with the Newspaper Enterprise Association. 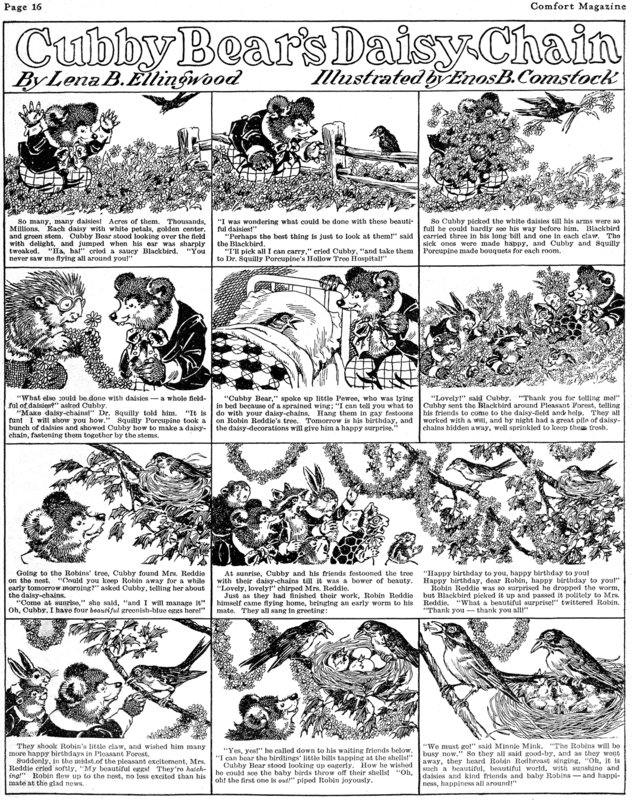 During my several years as one of their comic artists, I drew a number of features, the most original and popular being a strip called Billville Birds., which received quite a run. However, it was handicapped by the fact that the human angle was missing -- which is essential to put a thing over nowadays. Up to this time everything was running smooth except for my being gently eased out because of various fights over ideas that didn't end in a draw. Having a little ready cash on hand, I packed my ink pen and pencil, along with three features I had worked up and several mornings later woke up in the world's largest city, generally referred to as New York. It was several days before I got my bearings -- and when I did, I set out to see the Woolworth building. While roaming around in that section I dropped in on several syndicates in Park Row, where I met and had quite a talk with the N.Y. Tribune Syndicate manager -- joining this organization a month later, drawing Junior, a daily feature that in the past three years has steadily climbed and enabled me to work with such men as Briggs, Voight, Winsor McKay (sic), Ted Brown, Ding, McBride, and last but not least, Pete the Bootlegger. My advice to young men with ambitions to become cartoonists is based on my own experience -- and that is to get into any art department where the work is being done, if only as office boy -- draw continually -- always be open to criticism -- try at all times to get your work in print and once you get a feature before the public half the battle is won. I have noticed "Cartoons" has done a lot to encourage amateurs, not only by publishing their work, but by printing interesting pictures, features and articles about those whose work you see daily. In regard to correspondence schools, I think them a huge asset, as they enable one to learn the fundamentals of comic art -- but as for teaching you to get ideas, they are out of the question, for one must be born with a sense of the comic -- and that can only be developed through hard work. I am a personal friend of C.N. Landon, of the Landon School; have been through his plant and advise his course. One of the best books published in years that no one in or out of the cartoon business should miss is "How to Draw Cartoons," written by Clare Briggs of this paper. It should be especially helpful to amateurs. 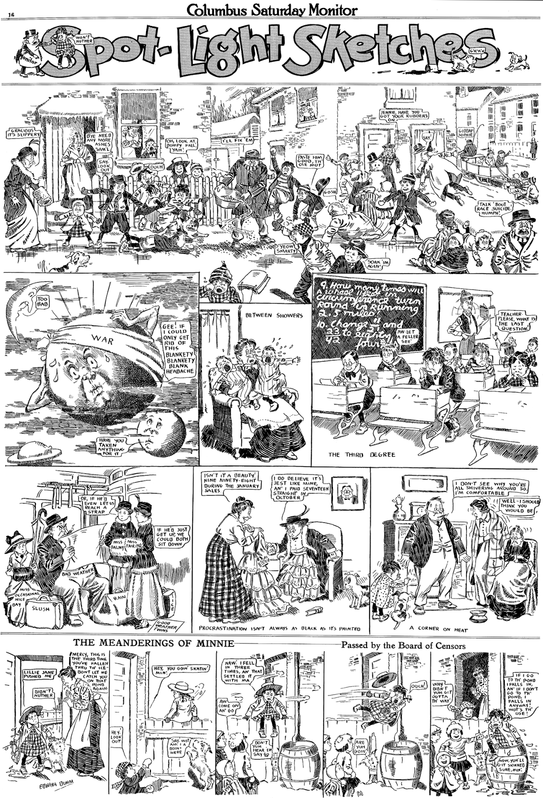 After the huge success of British import Andy Capp here in the colonies, American newspaper syndicates started looking at other British strips that might have success over here. The Perishers, which had been running in the Daily Mirror since 1959, was deemed by the Publishers-Hall Syndicate to be worth a try over here. The strip b y writer Maurice Dodd and cartoonist Dennis Collins was rolled out in a small number of U.S. newspapers starting on February 9 1970, and the fallacy of the idea was immediately apparent to readers.The Perishers is a fine strip, but it is so steeped in British culture and language that the strips are often all but incomprehensible to an American audience. 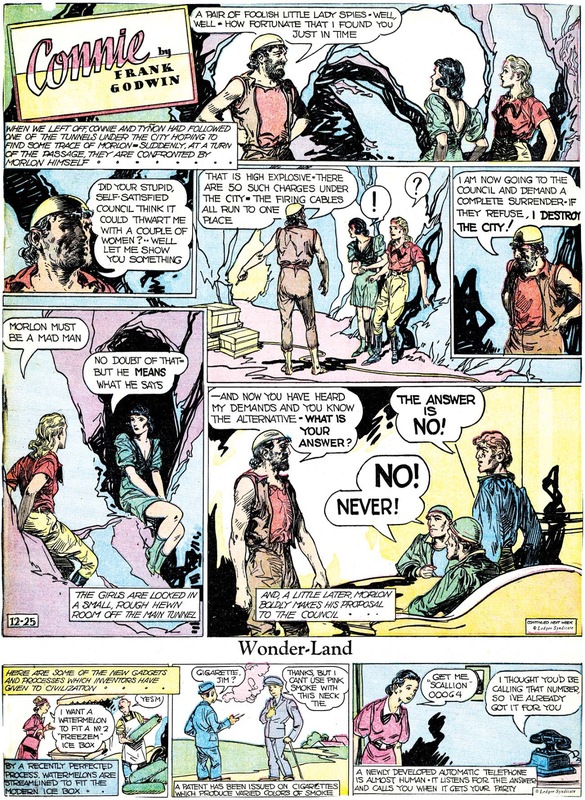 Publishers-Hall didn't choose to Americanize the strip in any way, so many strips would have needed extensive footnoting for the typical American to follow it. A strip like Andy Capp is so visceral that the occasional bit of dialect or a foreign reference does little to impact the function of the strip. A strip about a drunken lout who beat his wife may be a sick premise for a strip, but it is also undeniably simple and understandable. Not so with The Perishers, which has quite a few characters, complex relationships and personalities, and thoughtful gags.All of which is great if you can understand what the heck they're talking about. Naturally, the strip failed miserably in its U.S. distribution. As best I can tell, it seems to have been removed from syndication on October 3 1970, just eight months after its debut. It's a shame, because the strip had a lot going for it. 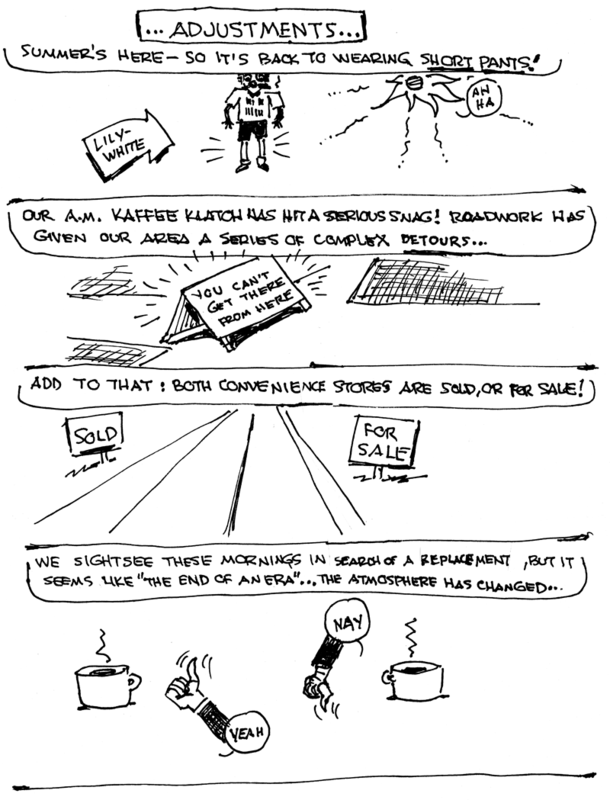 According to Editor & Publisher yearbooks, the strip may have had a second go-round in U.S syndication. 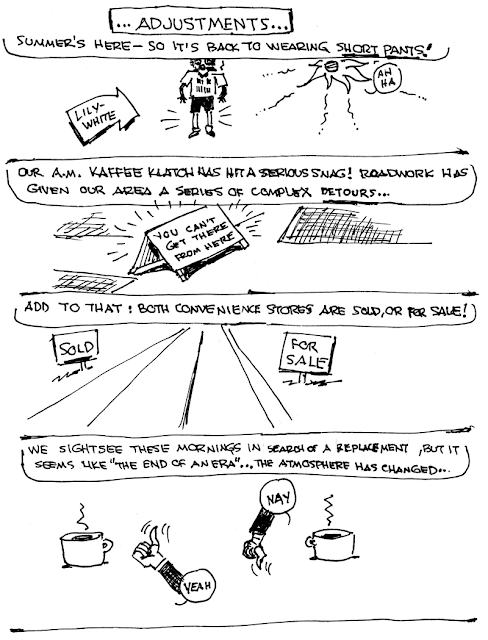 North America Syndicate advertised the availability of the strip from 1992-98. However, I have yet to find a U.S. paper that ran the strip in that run. Enos Benjamin Comstock was born in Milwaukee, Wisconsin, on December 24, 1879, according the the Wisconsin Birth Index at Ancestry.com and his World War II draft card. In the 1880 U.S. Federal Census, Comstock was the youngest of four children born to gardener Henry and Canadian-born Mary. They resided in Greenfield, Wisconsin. …Comstock was a South Side high school boy whose prowess on the football field and the track won games and made records for his school. He always insisted that his high school art studies under Miss Alida Goodwin…provided the solid foundation that he relied on all of his life. Since his teacher was a graduate of the school of the Art Institute of Chicago, it was natural for young Comstock to go there after his high school graduation in 1898. After his graduation at Chicago came several years of study in France, Italy and Holland…. The 1900 census and 1905 Wisconsin state census recorded Comstock at Greenfield in his parent’s household. He was a student. On June 22, 1905, Comstock married Frances C. Bassett in Chicago, Illinois, as recorded in the Cook County, Illinois, Marriage Index at Ancestry.com. The Journal said they met at school and traveled to Europe. The couple left Milwaukee in 1906 and moved to New York City. A postcard, postmarked August 15, 1907, was sent to Comstock’s wife at 556 West 186th Street in New York City. According to the Journal, Comstock “wanted to paint pictures with story telling implications” and found work illustrating for magazines and books. His favorite genre was westerns. According to the 1910 census, the couple and their son, Henry, resided in Englewood, New Jersey on Lake Street. Comstock’s occupation was illustrator, and Frances’ artist. Comstock signed his World War I draft card on September 12, 1918. His address was 178 Highwood Avenue in Leonia, New Jersey. The self-employed artist was described as tall, medium build with light brown eyes and black and gray hair. The Comstocks were at the same address in the 1920 census. The American Art Annual, Volume XVIII (1921), listed Comstock and his wife. Comstock, Enos B(enjamin), 178 HighWood Ave., Leonia. N. J.
P., I., W.—Born Milwaukee, Dec. 24, 1879. Pupil John H. Vanderpoel, Frederick W. Freer. Author and Illustrator of “Tuck-Me-In Stories,” “When Mother Lets Us Tell Stories,” “Fairy Frolics.” etc. Illustrated “She and Allan,” “When the World Shook,” “The Ancient Allan,” etc. Comstock, Frances Bassett, 178 Highwood Ave., Leonia, N. J.
P., S., I.—Born Elyria, O., Oct. 16, 1881. Pupil of Gari Melchers, Frederick W. Freer and John Vanderpoel. Member: NYWCC. Mrs. Frances Bassett Comstock, an artist, wife of Enos B. Comstock, also an artist, died yesterday of pneumonia at her home in Leonia, N. J. She was 41 years old. Comstock—At her home, 176 Highwood Av., Leonia, N.J., Frances Bassett Comstock, wife of Enos B. Comstock, Sunday, Feb. 12, 1922; survived by her husband and two sons, Henry and Alfred. Funeral services Wednesday, Feb. 15, at 2 P.M., All Saints’ Church, Park Cemetery, Englewood, N.J. Chicago papers please copy. A History and Genealogy of the Comstock Family in America (1949) said Comstock married Nellie Juline Warner on August 13, 1924. The 1930 census said the occupations of Comstock and son, Henry, were artists, illustrators and authors. During the 1930s, Comstock illustrated Lena B. Ellingwood’s Cubby Bear which appeared in the periodical, Comfort. Comstock’s address in the 1940 census and on his World War II draft card was 176 Highwood Avenue, Leonia, New Jersey. He was a self-employed artist whose description was six feet, 190 pounds with hazel eyes and gray hair. A History and Genealogy of the Comstock Family in America said Comstock passed away March 19, 1945, in Leonia, New Jersey. It seems the older we get the more "end of an eras" we see. Ah, but life goes on and "thanks for the memories." PS - See you soon!